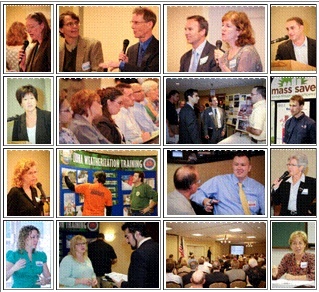 The second Massachusetts Green Careers Conference was held October 1, 2010 at the Marlborough Holiday Inn. The event strove to answer the timely question “What is My Role in the New, Green Economy?” by connecting stakeholders from business, education and government, and offering career guidance to job seekers from throughout the Commonwealth. This was a unique opportunity to reach these important constituents all in one place, grow green careers and help accelerate the greening economy in Massachusetts. The conference attracted 350 people and sold out 3 days in advance. David J Hess Professor in Renssalaer’s Department of Science and Technology Studies and director of the program in Ecological Economics, Values and Policy, and author of the Green Jobs Project about state and local government policies in the US. People learning about and participating in the greening economy, such as: local & state government staff, business people, educators, academic administrators, career service staff, workforce & economic development professionals, environmentalists, college students, professionals, job seekers, green career transitioners, and more. Gain knowledge and learn about careers from leading educators & experts in Massachusetts. Listen to experts talk about hands-on training, industry standards (BPI, IREC), and academic programs. Hear from businesses that are hiring, successful entrepreneurs & a business network. Sit down with one of six experts for a one-on-one meeting at the conference at no additional charge. Sustainability Experts – Coaching for business owners/staff who want to go green. Coffee and tea are Fair Trade and organic. Breakfast items baked on the premises or purchased from a local bakery. Carpooling with colleagues was encouraged. Ridesharing to this event available through www.Viamerge.com.